We removed this from a OKUMA LB15 CNC LATHE we were dismantling, machine was in working order when decommissioned. Morton 19035/2 Hydraulic Reservoir Tank C/W Motor & Piston Pump ! WOW ! Up for sale is a 35 gallon saddle mount aluminum Hydraulic tank with custom 2" ports (reducer can be used if smaller port size is needed) and internal baffling. It is proudly made in the USA and features a durable 1/8" aluminum exterior Also included is a oil level and temperature gauge, Filler breather cap with 40 micron 4" Nylon strainer. The gage is used but still in good condition. 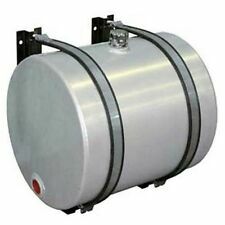 Aluminum Hydraulic Oil Tank W 2" bungs - 25 Gallons - *TANK ONLY* FREE SHIPPING! Dims: Hydraulic tank Ø24", Alum 5052-H32 0.125", 25 gallon, Right-Hand Gauge. Up for sale is a 25 gallon aluminum Hydraulic tank. Also included is a oil level andtemperature gauge, Filler breather cap with 40 micron 4" Nylon strainer. 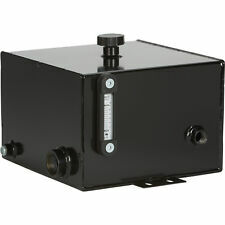 Delavan HYDRES-10MP PowerMAX™ 10 Gallon Steel Hydraulic Reservoir Tank with Inlet 2" NPT and Outlet 1" NPT. Constructed of sturdy 12 gauge steel and black powder coated for protection and durability. 6" Jacketed Spool x 36" Length - 1/2" FNPT Ports. 1/2" FNPT Ports on Opposite Ends. 6" Fully Jacketed Spool. 8" Jacket (Around 6" Spool). 36" Length. New 2.8 gallon steel tank assembly with pre-punched and slotted 4" x 2" mounting angles. Powder coated black paint. LDI INDUSTRIES G305-2. Glass Tube / Buna Seals. 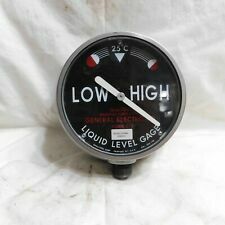 1/4" NPT Fluid Level Sight Oil Gauge W/Top Relief Hole. KENKO ENGINEERING Model 4400. 1/4" MNPT Glass Tube Fluid Level Gauge. NEW - In Box. Suction Port: 2". SEE OUR FULL LINE OFHYDRAULIC POWER SYSTEMS & ACCESSORIES BY FOLLOWING THIS LINK:OUR HYDRAULIC SYSTEMS & ACCESSORIES LINE. Fully baffled for use with central hydraulic systems. Oil level gauge and temperature indicator. Brand New 18" Round Water Box. Condition is New. Shipped with USPS First Class Package. Suction Port: 1.5". SEE OUR FULL LINE OFHYDRAULIC POWER SYSTEMS & ACCESSORIES BY FOLLOWING THIS LINK:OUR HYDRAULIC SYSTEMS & ACCESSORIES LINE. Black powder coat finish. Heavy duty 14 gauge steel construction. Sight Glass, Easy-View Sights, Domed, Shatter-Resistant, Multiple Angles, 1-1/2"
EASY-VIEW Glass Sight MCMC PART# 1128K6 Pipe Size is 1-1/2" NPT Male ZINC-PLATED STEEL View tank contents from multiple angles through the plastic domed window. Shatter-resistant window. For use with; Hydraulic Fluid Water Diesel Fluid Temperature range is 0 to 160 F. Window Diameter: 1-5/8" Hex Size: 2-1/8" Max PSI @70 F: 10 PSI Window Material: Plastic Seal material: Buna-N Rubber. 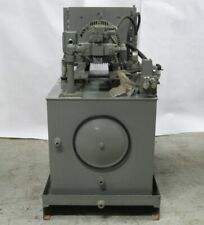 Master Pneumatic Detroit 473RG Serv-Oil Warranty! Fast Shipping! Master Pneumatic Detroit 473RG Serv-Oil Warranty! MPN: 473RG. • Model # 473RG. Used Master Pneumatic Detroit Serv-Oil. SEE OUR FULL LINE OFHYDRAULIC POWER SYSTEMS & ACCESSORIES BY FOLLOWING THIS LINK:OUR HYDRAULIC SYSTEMS & ACCESSORIES LINE. Black powder coat finish. Heavy duty 12 gauge steel construction. 2 Ports: 1.25" NPT Threaded. SPX Stone/Fenner plastic filler/breather cap. Push and turn to lock. Part Number #8060-CC. Model # : A202X5. Ports: 1/4" 1/8" NPT. Oil Reservoir. Office Hours Maple Grove, MN 55369. 9472 Hemlock Lane N. SKU# SB-103498. SPX Stone/Fenner plastic filler/breather cap part number 1214-AA. It has a 3/8" NPT thread. Sight Glass, Easy-View Sights, Domed, Shatter-Resistant, Multiple Angles, 1-1/4"
EASY-VIEW Glass Sight MCMC PART# 1128K5 Pipe Size is 1-1/4" NPT Male ZINC-PLATED STEEL View tank contents from multiple angles through the plastic domed window. Shatter-resistant window. For use with; Hydraulic Fluid Water Diesel Fluid Temperature range is 0 to 160 F. Window Diameter: 1-1/4" Hex Size: 1-7/8" Max PSI @70 F: 10 PSI Window Material: Plastic Seal material: Neoprene Rubber. Sight Glass, Easy-View Sights, Domed, Shatter-Resistant, Multiple Angles, 3/8"
EASY-VIEW Glass Sight MCMC PART# 6406T22 Pipe Size is 3/8" NPT Male Plastic sight impact-resistant window brass threads View tank contents from multiple angles through the plastic domed window. Shatter-resistant window. For use with; Hydraulic Fluid Temperature range is -40 to 180 F. Window Diameter: 1-1/8" " Max PSI @70 F: 65 PSI Window Material: Plastic. EASY-VIEW Glass Sight MCMC PART# 1128K3 Pipe Size is 3/4" NPT Male ZINC-PLATED STEEL View tank contents from multiple angles through the plastic domed window. Shatter-resistant window. For use with; Hydraulic Fluid Water Diesel Fluid Temperature range is 0 to 160 F. Window Diameter: 1" Hex Size: 1-1/4" Max PSI @70 F: 10 PSI Window Material: Plastic Seal material: Buna-N Rubber. EASY-VIEW Glass Sight MCMC PART# 1128K4 Pipe Size is 1" NPT Male ZINC-PLATED STEEL View tank contents from multiple angles through the plastic domed window. Shatter-resistant window. For use with; Hydraulic Fluid Water Diesel Fluid Temperature range is 0 to 160 F. Window Diameter: 1" Hex Size: 1-1/2" Max PSI @70 F: 10 PSI Window Material: Plastic Seal material: Neoprene Rubber. Sight Glass, Easy-View Sights, Domed, Shatter-Resistant, Multiple Angles, 1/4"
EASY-VIEW Glass Sight MCMC PART# 6406T21 Pipe Size is 1/4" NPT Male Plastic sight impact-resistant window brass threads View tank contents from multiple angles through the plastic domed window. Shatter-resistant window. For use with; Hydraulic Fluid Temperature range is -40 to 180 F. Window Diameter: 1" " Max PSI @70 F: 65 PSI Window Material: Plastic. Suction Port: 2". Includes suction strainer. SEE OUR FULL LINE OFHYDRAULIC POWER SYSTEMS & ACCESSORIES BY FOLLOWING THIS LINK:OUR HYDRAULIC SYSTEMS & ACCESSORIES LINE. Black powder coat finish. Heavy duty 12 gauge steel construction. 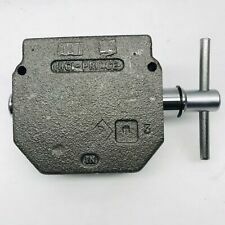 67401-32200-71 Toyota Forklift Hydraulic Cover 52-6FGCU45. We are a surplus warehouse and have many great parts for great prices. Don't like the Price?. ￼WARNING: These products contain a chemical known to the state of California to cause cancer and birth defects or reproductive harm. Unit is being sold as a lot of three. The unit appears to be new and unused by the previous owner. Overall the unit appears to be in excellent, new, ready to use condition. Unit includes everything shown in pictures. NEW LDI Industries R154-02 2 1/2 OZ. CAP 1/4" NPT GRAVITY FEED RESERVOIR. Title: NEW LDI Industries R154-02 2 1/2 OZ. CAP 1/4" NPT GRAVITY FEED RESERVOIR. Fast Dispatch Service. We're down to earth, easy to work with people. Aro Fluid Power E252FS Foot Pedal Pneumatic. Vogel 886-BWW7-V57E Centralized Lubrication Warranty! Fast Shipping! Vogel 886-BWW7-V57E Centralized Lubrication Warranty! 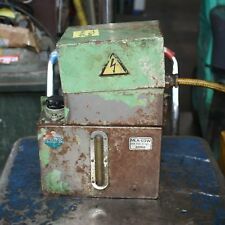 Used Vogel Centralized Lubrication Tank. Suction Port: 2". SEE OUR FULL LINE OFHYDRAULIC POWER SYSTEMS & ACCESSORIES BY FOLLOWING THIS LINK:OUR HYDRAULIC SYSTEMS & ACCESSORIES LINE. Black powder coat finish. Oil level gauge with temperature indicator. 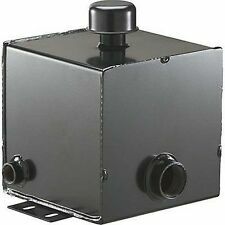 Includes a ¼ turn filler breather unit with bracket strainer - Brackets & 24" insulators. Brackets & 24" insulators are included. Includes a ¼ turn filler breather unit with bracket strainer. CONSTRUCTION: Aluminum. Steel Hydraulic Oil Tank 2.8 Gallon - NPT Suction Port 1 1/2" - Return Port 3/4"
Steel Hydraulic Oil Tank - 2.8 Gallon. Press to translate. Suction Port (In.). 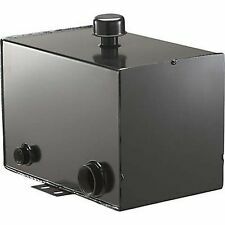 This Steel Hydraulic Oil Tank features a sturdy 12 gauge steel welded construction with a black powder-coat finish. Welded-on mounting brackets. Capacity (Gallons): 5. Press to translate. Lower 48 United States. Steel: Yes. within the Lower 48 United States. All of our products are sold with at least aOne Year Manufacturer's Warranty. Welded 12 Gauge: Yes.